It’s been six years since we last had our outing as Death in Darksiders II, who was trying to clear the name of his brother War from the first game. Fortunately, I’ve recently been able to take up the reigns of War and Death’s sister, Fury, in a hands-on preview of Darksiders III by developers Gunfire Games (Darksiders II: Deathinitive Edition). Worth noting is the fact that Gunfire Games was started by the president, and six other members of former Darksiders developers Vigil Games who then later became Crytek USA. The history of these core members as part of the Darksiders franchise shows as Fury, with her fiery visage and fast-paced fighting abilities, looks and acts like she would feel perfect alongside her two brothers and the up to now unseen Strife. One way to truly explain the changes to Darksiders III, compared to the previous games, is that it’s become a little more Souls-like. Indeed, one of the major inspirations is that the world is now an interconnected whole, acting as a sort of single giant dungeon in which you work your way through different paths. To create the sense of progression, as you take down one of the bosses, all other enemies will become more difficult. To a point, they will be scaling with you based on your progression, rather than your level and abilities. In the case of the demo I played through, I found myself facing Sloth, a huge insectoid creature, sat on a throne and being moved about by his minions. If the area I played through is an example of all those found in Darksiders III, they’ll be quite expansive but also very complex. At least a few times I found myself lost or at least confused on how to progress, meaning I did backtrack. At the same time, I was also able to find some secret areas and learn a few mechanics through observation, or trial and error. For example, there were glowing rocks blocking a path. To open the path I had to pick up an insect and move it to a pile of goo dropped by something hanging from the roof that I attacked. It ate some of the goo, grew and started glowing. This was, once picked up, effectively a bomb that is designed to specifically open these areas, though it can be used as a weapon. The only problem I can say I have with it is that there is no real map or minimap. This is by design though. Much like the Souls games, the way the game is laid out is designed to incentivise and reward exploration. I just found myself hitting a few seeming dead-ends and having to backtrack, only to head back once again and find my way through. I do have to admit, part of this was me missing holes or other areas I could crawl through. However, one point was due to the game not raising a button prompt (explanation) telling me that I could use my whip-attack button when jumping to use the chain whip to hook onto and act as a swing-rope. Granted, it is a preview build and seemingly towards the end of one of the games path. I doubt it will be indicative of the final quality of the game, nor do I imagine you’d need a button prompt at a later stage. There’ll likely be a tutorial area that covers everything. As mentioned, I faced Sloth in this demo. Taking place roughly at the same time as Darksiders 2, Fury is tasked with hunting down the physical manifestations of the seven deadly sins. Fury is joined in this task by a companion called a Speaker. 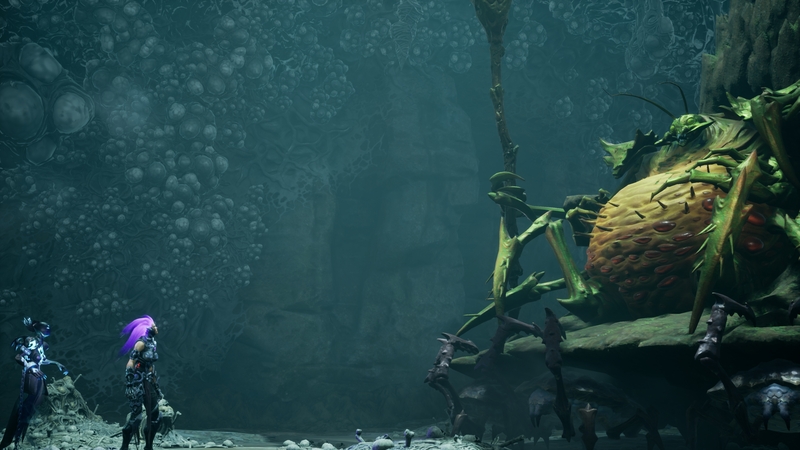 I can’t say I know exactly what role the Speaker will take in Darksiders III; in the case of the demo I played, the Speaker simply passed comments when necessary and also egged Fury on when it seemed she may be falling into the lure of Sloth during a cutscene prior to the fight. Still, from what I’ve seen it seems that Darksiders III will fit in well with the series as a whole. It’s still fantastical in nature, taking control over one of these versions of the Four Horsemen of the Apocalypse. As you fight through areas you come across monstrous beasts and other creatures in a world that has truly met the apocalypse. Quick question: shouldn’t it be Four Horsepersons of the Apocalypse as Fury is female? It doesn’t really matter, just a random side-thought that popped into my head. What I did get to experience while playing through this section of Darksiders III is the combat and development of Fury. There are a few core points to note and, much like with the world design, there are elements influenced by the Souls games. In the case of character development, these are literally souls. As you kill enemies, you’ll absorb souls and you can also pick up items throughout the world that, when used, grant you with a certain amount of souls. These souls will then be used when talking to an NPC to either trade for items, of which there are a number of varieties from consumables to ones that you will be able to use to improve your equipment. The other function is that you feed these souls to whatever this NPC is. Feed it enough souls and you level up, granting you an attribute point to put into either health, physical strength or arcane strength. You’ll certainly need that strength too. As stated, the more of the seven deadly sins you defeat, the harder even the regular enemies become. Even at the very beginning, these are far from a push-over, with there being a good variety for you to encounter. In the case of Sloth’s domain, they’re all insectoid or animal in nature. From ones with hard shells that could tank your hits to strange bat-like creatures that are quick and agile up close, but from afar still dangerous as they spit a lethal substance at you. Others ranged from fiercely strong to weak but numerous. Combat was fewer and farther away than in previous Darksiders games, but considerably more challenging. It also required much more finesse. Keeping the same fast-paced combo system as found, the game required smart positioning as your combos can be interrupted by other enemies if you’re not careful, and even yourself if smart. For example, once I finally got accustomed to the fighting system I was able to start a combo, then dodge at the exact time a large enemy went for me, allowing me to unleash a powerful counter-attack. Before this, though, I died more times than I care to reveal (more than 5). One other interesting thing with the counter system is that it’s also challenging to master, as the key timing differs for each enemy, but it’s terribly enjoyable when you manage it. What I did like about combat is the use of combinations to clear the gap between you and the enemy. Either bringing them towards you with the chain whip or making the most of other attacks to stun or knock back others and give you a bit of breathing room. it took a little getting used to but once I was, it was free flowing and a joy to watch, as the fires of Fury danced around. Particularly if you engage her wrath mode while in fire form, seeing embers spark from her, setting all nearby enemies on fire and also adding extra damage and fire effects to your normal attacks. Another aspect that should improve the game are elemental forms that give Fury new abilities. In the demo I played I was able to use either her Fire Hollow form or Force Hollow form – Fire is certainly the flashier of the two, though all forms have their own unique abilities to aid in exploration and progression. For example, the fire hollow form allows Fury to literally walk through fire, gives her secondary weapons of nunchucks and the ability to jump higher, propelled by her flames. Exactly how many forms there will be I don’t know, but I am surmising four as they are swapped on an Xbox controller using LB and a face button. It’s a truly engaging system that combines a fast-paced hack and slash style with the challenging build of Souls-like games. I was able to make slight improvements to Furys weapon and equipment while playing too, showing what is a limited but still effective RPG system. How much this will be expanded on in the full version of Darksiders III is yet to be revealed, though some of the items I collected indicated that there will be an NPC that allows you to upgrade your weapons further – potentially other equipment too. 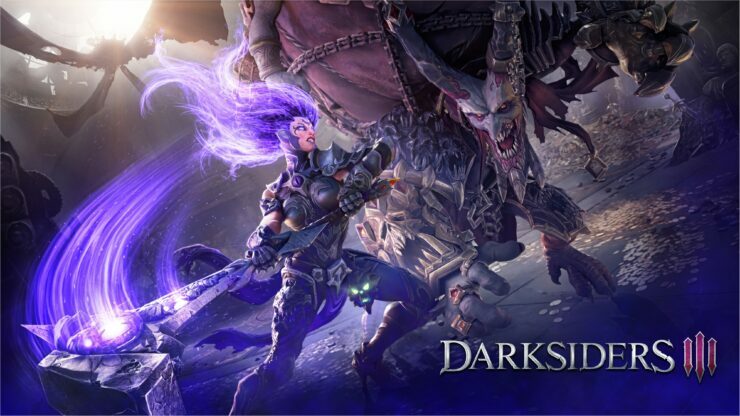 Releasing on the 27th of November on the PC, PlayStation 4 and Xbox One, we don’t have a long time to wait for Darksiders III. While I’ve found myself frustrated, at least to an extent, while playing through the game, a lot of it has been through my missing of paths or the learning process of combat. There’s a lot of promise to be found here. I certainly think the move to a more calculated battle system in a less linear world that allows for more exploration will benefit the game greatly.